Just one GFS ensemble member has a crossing now, jeez. Will this be one of those times when the GFS somehow outperforms the Euro? I think we will get something, once the convection in the eastern Coral Sea breaks down, that's when we will cop it. I thought the whining noise was the wind overnight, but now I realize it was the whinging on this thread, makes me look like a motivational speaker. We went for a drive yesterday down the highway to Glengallen Homestead North of Warwick. The grass is green but even from South West Toowoomba the dry gullies and creaks and low dams start. There are wetter patches in places. You people have had beyond comprehension more. Unless something radical happens, apart from the coastal strip it's a long dry outlook. Thanks, tsunami, but I should add where I live in the more eastern parts of Toowoomba, even going back to October, we have done massively better.I have absolutely no complaints about what I have received. I just looked at the WATL update. It seems to have even increased the falls for the second 4 days for the coast and hinterland. That's it, tsunami. 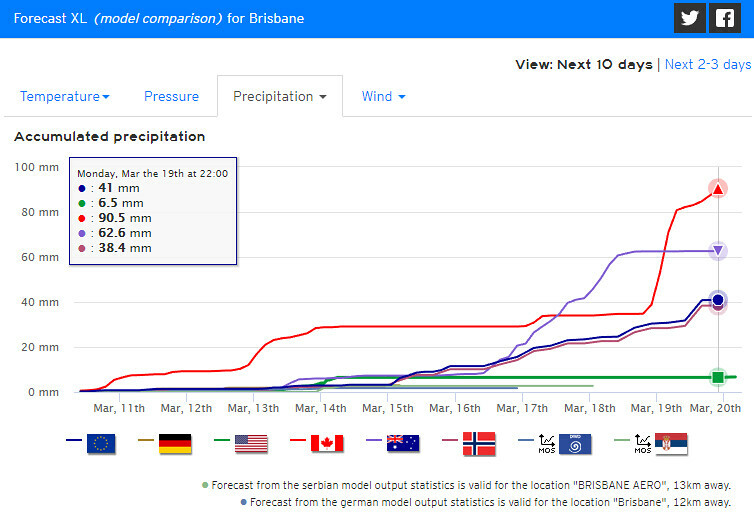 Why would anybody down there want a big rain/cyclone event? It would be terrible. Ill be happy not to live in a place that gets kicked by a cyclone again. I was in Fiji at the time of Cyclone Winston a Category 5 monster that devastated he place and claimed many lives.I always wanted to see and be close to a big cyclone but after that . . . never again.It was sad to see wind just trash a landscape especially a beautiful tropical one at that.The excitement is in the lead up though, not knowing what to expect and how bad it will be. By the way Kazz63 I suppose I do need to get more of a life for myself , have been feeling a bit lost for the past 9 months not being able to work or surf anymore due to a major injury to my shoulder surfing. Chasing and photographing thunderstorms has always been right up there as far as my passions go. Sorry to hear about your plight Tweedstorm. I was thinking more about flooding than wind damage from any system. I have to go out for a while but if anybody is offended by my post I apologize. I woke up in a really bad mood this morning. Aw sorry, I didn't mean it to come across as a "get a life" sort of post and for my part I misunderstood a bit. You are talking storm set ups, I was talking rain set ups. Also, please note that sentences can also end in full stops. The exclamation mark can be overused. 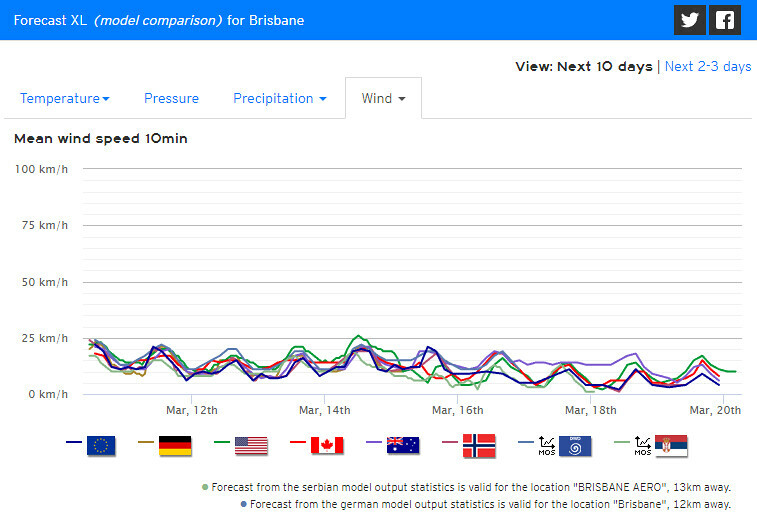 Here's the spread of scenarios among some of the models (including EC, GFS, ACCESS-G, CMC, etc) for accumulating rainfall amounts and sustained wind speeds for Brisbane over the next 10 days. Just curious about that area you speak of. The rain will come eventually, so how many new dams & other water storage facilities have been put there in order to get maximum benefit of anything that comes along? Some onshore showers affecting the GC at the moment. Perfect ingredient to feed the Tropics/Goc and CS strengthening trade winds so will see what area sparks up from it. Just down the New England Hway From Toowoomba to Warwick. Kazz63. You may have read MichaelE2Sky's posts. It has been a dry frustrating summer, but although things have improved a good dump of rain is still needed. As for dams and such, I do not think anything has been done for decades but I could be corrected. That may be one for the political thread as to why not. While yes, the government could build more dams out that way, I was referring to the land owners. There's facility there to gain funding from Government loans etc, why haven't people started helping themselves? If they re not proactive about their future they may as well pack up & move to a better location. Can't claim to be farmer if they don't manage their land to a self sufficient state. I don't see it as a political problem at all. Building dams is great if the money is available to already struggling farmers but government loans are still just that, a loan. It's been a hard few years and they just cant stand more debt even in the south west. And to add to that you need the rain to fill the dams. Many have empty dams. We have a small dam out the front and havent had more than a puddle in it for over 3 years. 100mm in a month helps with grass but unless we get 100mm in a downpour the dams remain empty. The heavy downpours have been patchy at best and without consistent falls they empty out pretty quick. Lively shower atm. Gone quite dark.